Sheep dogs come in every shape and size including the highly likeable plastic toy replica's, perfect for the most loyal fan of the Border Collie. Border collie toys can be instantly recognised by there distinguished fluffy black and white coat, pointed noses and floppy ears. Toy Border Collies were once so popular, and still are today, every major toy maker had at least one model in their range. 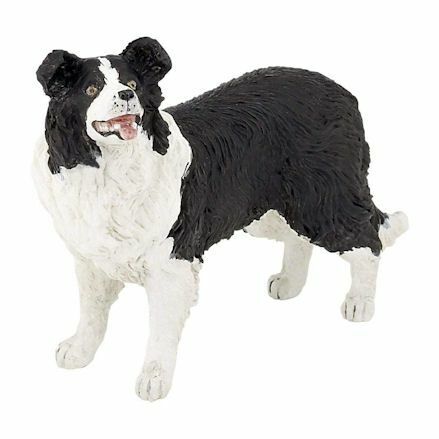 Although each producers Border Collie toys do have a few features in common, they are all made from a strong, durable plastic, positioned in standing poses and hand painted in black and white paint, replicating the real life dog. Here, we take a look at the current range of toy Border Collies currently available on the market. Among the top brands of replica plastic toy Border Collie's, at the moment it's only Bullyland who have discontinued there version, and retired the old sheep dog to their own history books. 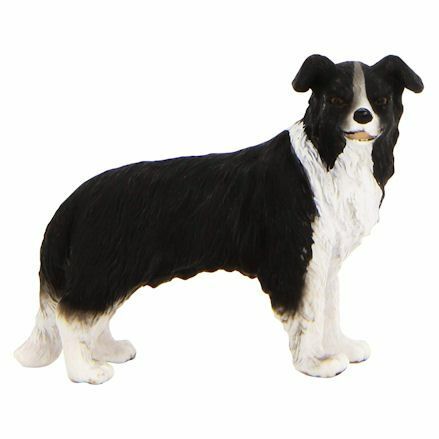 Collecta's very own toy Border Collie (pictured) is a tuff little replica, moulded in a standing position looking over to his right. The model has been painted using hand brush techniques and likely finished with an air brush to create the fading out effect around his on legs and tail. His eyes have been painted with a very high gloss, clear paint or sealer to produce realistic looking glaze in the eyes. As Collecta's very own model is a stand-alone due to its size, so he's very unlikely to match up by scale with Schleich or Papo's Collie, but he won't look out of place when used with Safari's own models due to being very similar in scale. You can also find this model in Collecta Sheep box set. 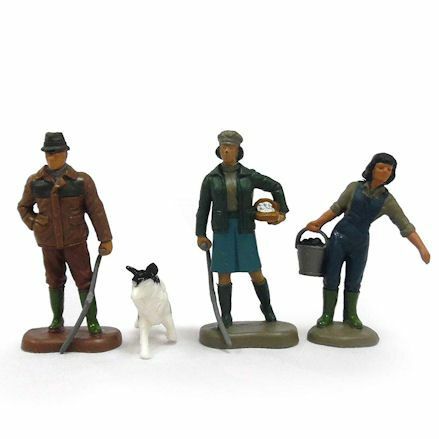 It's hard to believe Britains farm toys have their own toy Border Collie, but indeed they do, hidden in the Britains Farming Family (40954) box set. This particular toy Border Collie is in a 1:32 scale so the finished model is tiny compared to other Britains farm toys. At first glance the model is not a perfect replica, or indeed a very good one. In fact the model looks more like a fox with only the black and white painted finish indicating the breed of dog it is. 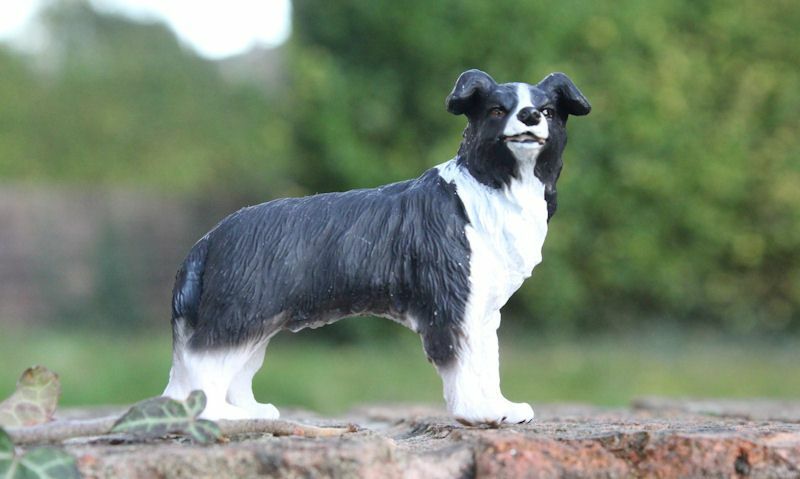 But for such a small model the Britains Border Collie is made in a sturdy plastic and hand painted. This toy dog certainly adds a little more play value to the Farming Family set. 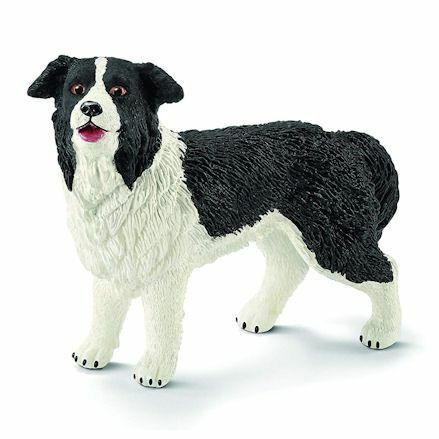 You could be mistaken thinking this Schleich Border Collie model belongs to another breed due to the mould being slightly less accurate than less, well known brands of toy figures. Among the few flaws is the painted finish in the black and white just not being bright or shiny enough, or indeed the evil orange eyes staring into the abyss (feature not visible in the picture to the right). What Schleich have done well however is the finished mould representing the real life Collie quite well, particular from a distance it looks impressive. Its only on close inspection one might be put off with the few flaws mentioned above. 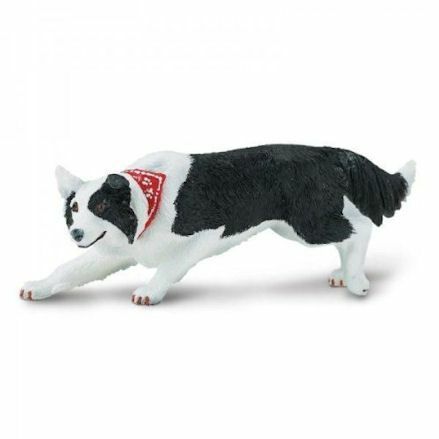 As usual, Schleich's Border Collie is finished in sturdy plastic and hand painted. Papo's Collie is in similar 1:24 scale as Schleich, but only Papo have produced a much more impressive toy Border Collie than it's competitors, although Collecta have run them close. The model's face is a near perfect replica, filled with intricate detail from the glossy eyes to the tongue and mouth. It's coat is very obvious due to the detailing in the body representing a very fluffy dog, with big ears and four strong legs to keep him standing. The white paint finish is nice and bright with the dog sculptured in a standing position looking over to his left and slightly looking upwards. It's made in a strong plastic material and hand painted in the finest detail. The most active Border Collie toy dog within the collection, this Safari Ltd Border Collie is available from the Best in Show collection. As expected, he or she will fit in with all Safari Ltd toy dog and will most certainly be a welcome sight within the Safari Farm series. We talk about Border Collie's used for herding sheep, and as you can see this one is crouched down and directing the Safari Ltd sheep right now. He's wearing a traditional scarf tied around his neck with his front legs stretched out. Finished in the usual black and white coat with his mouth closed, ear pointed up with highly detailed eyes. 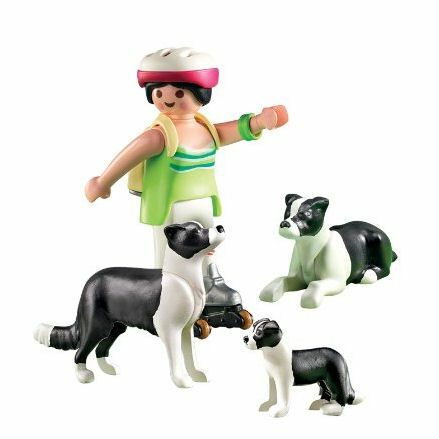 One of many dog breed playset's available, comes this Playmobil Border Collie set complete with boy, plus two adults and one puppy. Its up to the boy to look after this dogs well keeping the mum and dad fed with lots of drinking water, and a great opportunity to teach the pup new tricks. The boy is kitted out in safety gear wearing roller blades, so head to the park and take them for a good run. Interestingly, both adult Border Collie's can be positioned into classic dog positions; laying, sitting and stretching - which is needed for playing, running and going walkies. 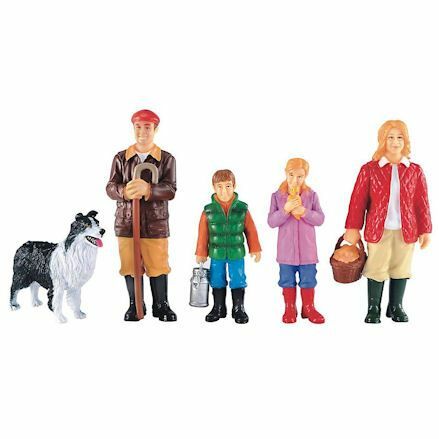 Turn your attention to the Early Learning Centre Farm Family figure set and they to - just like the Britains farming family - come with a pet Border Collie dog. Why not commit to a single dog figure when you can get a whole figure to head up the farm or home with the bonus of four extra figures. Included in the set is the dad whom acts as the head farmer, the mother, and two children, all of who are dress for working on the farm. The ELC Border Collie measures up similar to the figures mentioned above, though you'll find him a little smaller than most. He can be used with or without similar brands, no dog is the same and will fit in just fine, weather he's to small or to big. All figures are free standing so don't need a base to keep them up right, well made to be used with elc farm sets, they're compatible with most farm sets.